We celebrated our 25th anniversary on Wednesday of last week. I wrote an abbreviated post on the occasion, abbreviated because I was using my iPad, abbreviated because the WiFi at the hotel where we were staying stopped working, and ultimately, abbreviated because it was, after all, our anniversary. I will take the opportunity here to elaborate on our outing to the Kitsap Peninsula. As noted in the earlier post, we stayed overnight at Alderbrook Resort and Spa, which sits at what one might call the elbow of Hood Canal, a long and thin body of water cutting southwest into the Olympic Peninsula, then turning east-northeast for a few miles before ending at the small town of Belfair. 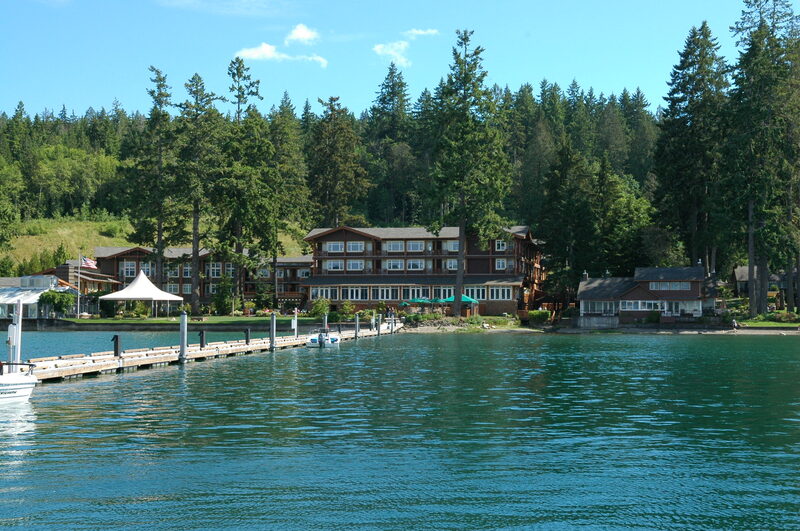 Alderbrook sits on the south side of Hood Canal where it turns east. To get there, we took the ferry from downtown Seattle across Puget Sound to Bremerton. 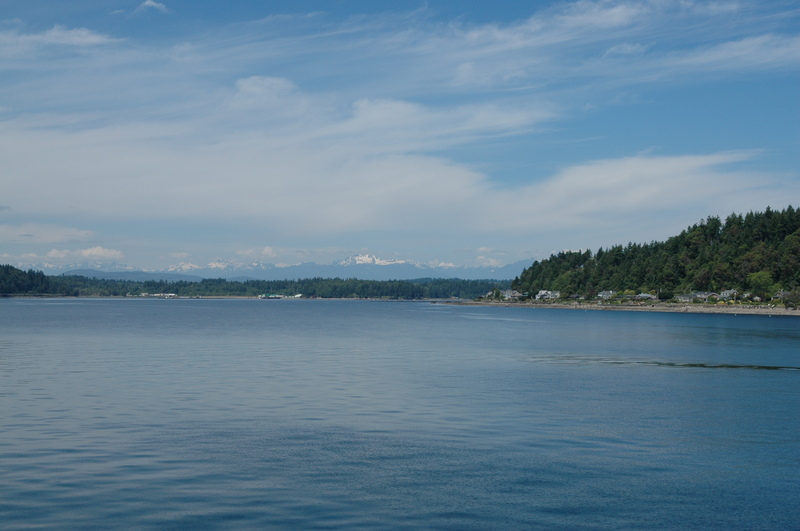 Before getting to Bremerton, the ferry must navigate some narrow channels on the south side of Bainbridge Island. The photo at the top was taken along this stretch. 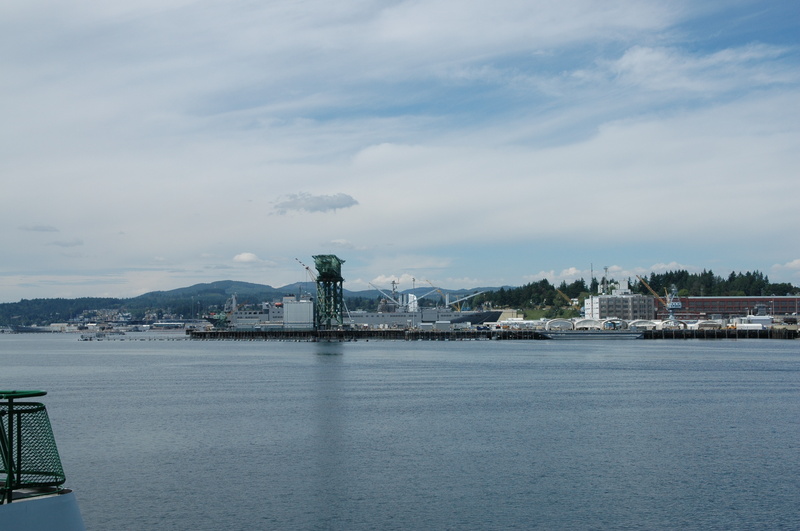 We arrived in Bremerton around noon. Before driving on to Alderbrook, we decided to have lunch in Bremerton. We hadn’t been there in years, so we drove around a bit to get oriented, then parked just short of what seemed to be the central intersection of Bremerton’s arts district. Some construction was underway, to put up new street lighting and perhaps to complete what looked like new public art installations — a fisherman some 15 feet tall on the northeast corner, facing southwestwards to the diagonally opposite corner, where an equally tall fish had hold of the fishing rod and seemed to have caught the fisherman. Perhaps we’re mis-interpreting. We walked a couple of blocks down the street, then returned to the intersection to eat at 2 Blocks Up Cafe, on the northwest corner. We ordered sandwiches, sat down, and tried to ignore the muted TV that sat above us. But when the coverage switched to World Cup coverage, we got a cookie to share for dessert and stayed to watch the conclusion of the Australia-Serbia game. We headed out of Bremerton past the Puget Sound Naval Shipyard, with its row of moth-balled aircraft carriers, always a dramatic sight. Then on to Belfair, to the southwest, and soon thereafter we were at the tip of Hood Canal. I don’t recall ever driving along this part of the canal, so it was a surprise to me, mile after mile, to see the almost unbroken line of homes along the shore, combined with the lack of any other development nearby. 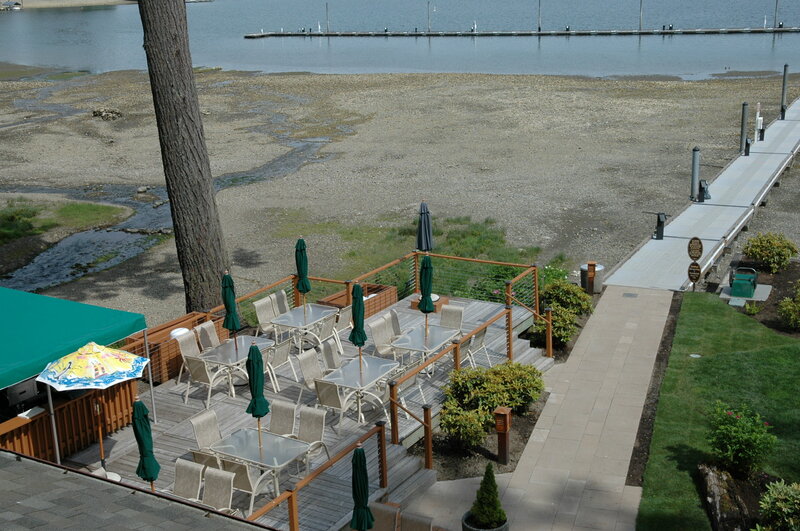 Occasionally a structure would appear on the opposite side of the road, but largely there are miles of beach homes and nothing else, until one arrives some 12 miles later in Union, home to Alderbrook Resort. The resort was upon us before we knew it. We drove right by, unintentionally, but decided to keep going so we could see Union. Another mile down the road, we headed up the hillside that rises immediately from the road along the water, passed houses, but missed the center of town, if there is a center. Not at all what we expected. After a couple of minutes of that, we headed back down to the waterfront road, retraced our steps, and pulled into Alderbrook. You can get a sense of the resort’s layout from the photo below. This is taken from the dock, a T-shaped affair with a long arm perpendicular to the shore and then an even longer stretch parallel to the shore farther out. After resting briefly in our room, we walked around the resort and out to the dock, at which point it was just past high tide. That’s when I took this photo. (Only the next morning, when we walked out after breakfast, just past low tide, did we understand why the parallel stretch of dock is so far out. The shoreline has only a slight slope, resulting in an intertidal area that stretches way offshore and necessitating tying up boats far from shore.) At the center of the photo is the three-story structure that consists of the restaurant, on the ground floor, and two floors of guest rooms. Those facing out over the water above the restaurant are called the waterfront rooms. We stayed in the lower of the two floors, just above the restaurant, in the room second from the left. The glass structure to the left is the swimming pool, with a small fitness center behind it and a spa behind that. Just to the right of the restaurant structure, you can barely see a creek flowing into the canal. To its right is a set of cottages, some privately owned and some rented out by the resort (as we learned when we went back in to the front desk and asked). The house right at the beach is half and half — the left side is privately owned; the right side is for rent. The tented and umbrelled area in front of the restaurant to the right is the patio cafe, where we sat to have a snack after our walk around the resort. A fellow was setting up a sound system when we sat down, then proceeded to put on a Loggins and Messina CD, which played in the background as we sat. Just after we made it back to our room, around 5:00 PM, he returned to play live music. I noted this in my earlier post, written from the room as we relaxed and waited for our 7:00 anniversary dinner: “Below us is the outdoor lounge/bar, a raised porch-like affair along the water, and we are sharing in the bar’s live entertainment. Not that there’s a choice, but fortunately we’re enjoying it. A guy in a Hawaiian shirt is playing ukelele and singing, with karaoke-style accompaniment. A little Jimmy Buffett, Loggins and Messina, and now Peter Frampton. In an hour we’ll head down to dine at the restaurant. We dressed up for dinner — it was a momentous occasion — but of course no one else in the restaurant was so dressed up. The young hostess, wearing a trainee button, sat us away from the windows that overlook the water, so I asked if we could have one of the empty but not-yet-cleared window tables. After some delay, she sat us at a tiny one, not what I had in mind, so I was more specific this time, pointing to a larger one, and after yet another delay, we sat there. You can review the dinner menu here. Right now, it’s still the same one we had last week. We shared the Dungeness crab cakes with scallion yogurt and the citrus fennel salad with citrus vinaigrette and grapefruit to start. Both were excellent. For the main course, Gail had the pan seared sea scallops with citrus vanilla saffron buerre [sic] blanc, but now I see that the menu has in fact changed, because in place of the listed heirloom fingerling potatoes, she had the jasmine rice cake that shows up elsewhere on the online menu. I was leaning toward halibut, but I didn’t want the lobster salad. Instead, I went for the New York steak with crimini mushroom, asparagus, and purple peruvian mashed potatoes. We were both happy, but I have to admit that I’ve had better steaks. It didn’t help that I ordered it medium, or just past medium, and it came out medium rare, so the waiter and I agreed that it should go back, only to return somewhere past medium well. Still, the room was lovely, the views were wonderful, we could watch the musician playing out on the patio (but not hear him, with the windows providing surprisingly good sound proofing), and we were happy. For dessert, our waiter explained that guests celebrating an anniversary or birthday were given vanilla crème brulée. Since Gail isn’t much of a crème brulée fan, she ordered “Summer Bliss”: strawberry mousse, rhubarb and sweet mint simple syrup. I took the complimentary crème brulée. We were again both happy. By now we knew that the musician’s name was Biff Moss. He told us to hang on a minute, went back to a storage area under the restaurant, and returned with Ukulele Soup, his 2006 CD. He particularly recommended that we listen to his cover of Nights in White Satin, which he was proud of. For good reason. It has some striking ukulele playing. And now I eagerly await our trip down to Bahama Breeze in the fall. Some jerk chicken and pasta. Biff on the uke. It’ll be great. The next morning we returned to the restaurant for breakfast. Not much to say. I had to ask yet again to sit by the window. I had the Denver omelette. Gail had the breakfast burrito. After breakfast, we went out on the dock in low tide, as I already noted. Lots of mussels, barnacles, two giant starfish hanging out. And at the start of the water line, dozens of little crabs scurrying. On returning to our room, I took the photo below that gives a sense of how the beach looked. We packed, checked out, and headed north. More, perhaps, on our northern outing in a separate post.